: Water dog used for hunting wildfowl. Like all water dogs, the French Water Dog is more than just a retriever; he must search for, locate and flush out the game hiding in the water vegetation. He then retrieves the game shot by his master. Very resistant to cold, he shall go to water in all weather. : A very ancient breed, common throughout France, used for hunting waterfowl and described or mentioned in several works as early as the 16th century. : Medium proportions, medium size, characterized by a thick, woolly coat which guarantees efficient protection against cold and damp. The coat forms a beard (French barbe) on the chin, which gave the breed its name (Barbet). The length of the body, measured from the point of shoulder to the point of buttock, is slightly more than the height at the withers . : Even disposition, very attached to his master, very sociable, loving water even when very cold. : The coat on the skull must fall onto the bridge of the nose. The beard is long and furnished; the moustache entirely covers the bridge of the nose. : Broad, with well opened nostrils; black or brown depending on the colour of the coat. : Quite square. The bridge of the nose is broad. : Thick, well pigmented and completely covered by long hair. Black or brown edges. : Jaws of equal length. Scissors bite. Strong teeth. Incisors well developed and well aligned. : Round, preferably dark brown. The rim of the eyelid is black or brown. : Set on low (at eye level or slightly lower), long, flat, wide, covered by long hair hanging in strands. When brought together in front of the nose, the ears (including the hair) reach at least 5cms beyond it. The ear cartilage reaches further than the corner of the mouth. : Solid with well sustained topline. : Arched, short and strong. : Round, seen from the side, in smooth continuation of the line of the loin. : Broad, well developed, deep, reaching the elbow; ribcage rounded but not barrel-like. : Slightly raised, carried above the horizontal when the dog is in action, low set, forming a slight hook at the tip. : Oblique. The scapulo-humeral angle varies between 110° and 115°. : Straight, strong bone, upright, completely covered by long hair. : Round, broad, covered by hair. : Slightly oblique, well muscled. : Easy movement, the limbs moving in line with the body. Medium length foreleg stride with good thrust from the hindquarters. : Long, woolly and curly; can form strands. The coat is furnished, covering the whole body in a natural state. This is an essential characteristic of the breed. 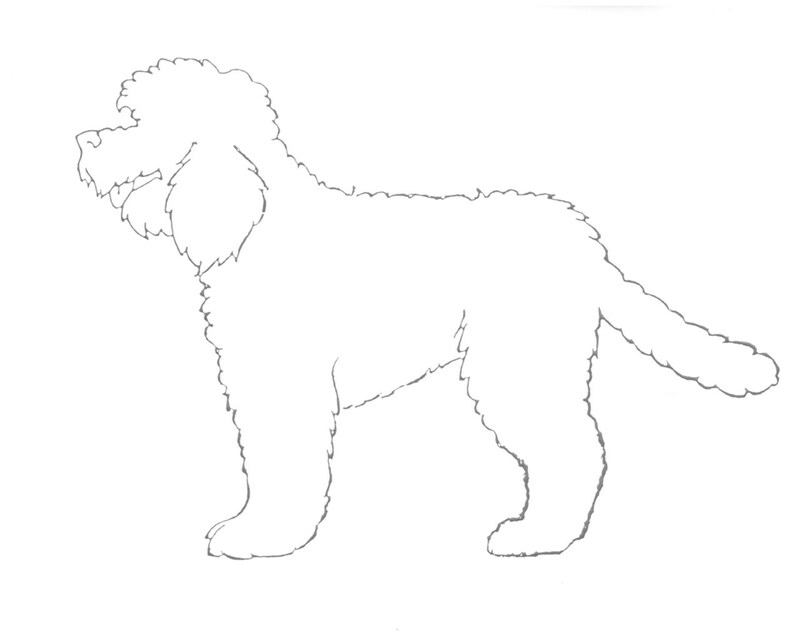 The French Water Dog may be groomed in a specific manner to accomodate its work and maintenance. : Solid black, grey, brown, fawn, pale fawn, white or more or less pied. All shades of red-fawn and pale fawn are permitted. The shade should, preferably, be the same as the colour of the body. Head fine and narrow, muzzle thin and too long, lips thin. Overshot or undershot. Wry jaw. Ears set high (higher than eye level), thin, short and narrow. Tail set on high, curved over the back, curled over or lying on the croup or loin. Tail naturally absent or too short. Forearm with fine bone; feathering. Hindquarters Upper thigh flat, hocks straight, feathering; presence of dewclaws. Feet fine and narrow, not covered by coat. Coat short, harsh, not woolly, not curly. Colours Any colour other than those mentioned in the standard.